As you prepare for the GRE, it’s important to look at application deadlines and different exam dates. Of course, if you’re attempting to apply for a graduate program, you should already be familiar with their own application deadlines. Give yourself plenty of time to apply for and take the GRE, preferably well in advance of your intended program’s application deadline in case you need to retake the GRE. Before you pick a date, you’ll need to determine where and how you’ll be taking the GRE. Most locations, especially within the United State, offer computer-based GRE options only. However, there are some locations that only offer paper-based tests. Once you figure out which applies to you, you’ll be able to better determine the best date. Paper tests are only administered three times a year so your options are much more limited. Apply to take the test at least two months in advance to try and secure your seat in these limited opportunities. The tests are generally scheduled for the first Saturday in October, November and February of each academic year and the deadlines for application are at least a month in advance. Computer-based exams are much more flexible and administered much more often throughout the course of the year. There are hundreds of locations in more than 160 countries, most of which offer this computer option. You can take the computer-based GRE once every 21 days but not more than five times in a 365-day time period. These are all important aspects to consider when comparing your intended institution’s application deadline and the GRE scores’ turnaround time. A good general rule of thumb to allow yourself enough time to prepare for, take and possibly retake the exam, and still have enough time for the scores to get to your target school, is to register for the exam approximately four to six months before your school’s application deadline. In order to protect test takers and help them as they continue their education, the GRE Board has set policies and guidelines in how to use (or not use) the GRE scores. The appropriate use, as defined by GRE Board, of these test scores is for admission to graduate or business school, selection of fellowship awardees, and guidance for graduate study. The GRE score alone shouldn’t determine whether a student gets into the graduate program. Institutions weighing applicants should look at all possible criteria including undergraduate grade point average and recommendation letters. The same diverse portfolio should be considered when awarding any fellowship grants. In order for the scores to be ‘official’ they must go directly from the ETS to the institution or organization awarding the fellowship grant. Any other means of obtaining the GRE scores (for instance, directly from applicant or other source) are void and should not be considered in the decision process. The ETS will only send official scores to select locations (an official learning institution or fellowship-granting organization) in order to keep the individual’s information secure. That same confidentiality is expected from the institution or organization to which scores are sent. A student’s GRE scores should not be used or sent outside of the institution for any reason and should be maintained on a need-to-know basis. The GRE test scores contain the test-takers percentile rank based on the previous three-year period of test-takers. This percentile rank is a dependable way to compare applicants and candidates when they are based on the same reference population. When comparing candidates, there are a few areas to avoid as they are unfair or inaccurate ways to measure differences. Small differences in GRE scores can fall into what the GRE Board classifies as the standard error of measurement and therefore should not be considered when comparing two closely qualified applicants. Different test subjects should also never be compared since a high score in one subject isn’t comparable to a high score in a different subject. While the guidelines above are recommendations for fair use, the GRE Board does have some policies that must be followed and both applicants and receiving organizations should understand those policies in order to maintain a proper GRE program. It’s always best to prepare for big exams as early as possible but that might not always be an option. Whether the decision to take the GRE was made later in the year or life just simply got in the way, it’s not too late to get ready for the big exam even as little as two weeks prior to the big day. Test takers can use this simple two-week guide to get fully prepared to take the GRE. Day 1: General Test (including timing, testing and scoring tactics), math (arithmetic and algebra). Finish up day with about 10 minutes of vocabulary study. Just a few minutes a day will help you memorize a few words prior to test day. Day 2: One hour on the Geometry, Data Analysis and Quantitative Comparison sections, followed by one hour on Reading Comprehension. Day 3: Practice writing and English tests as well as more vocabulary study. Day 4: Take a full-length practice exam to see where you stand in each section. Don’t skip any sections and do it all in one sitting to fully prepare for the actual exam day. Day 5: Review your practice test results. Depending on which resource you use to take this practice test, you should be able to review them not just by section but a breakdown of each question so you can see the correct answers and determine the areas in which you need to focus your studying on. Spend some extra time reviewing study material for the areas you came up short in and finish the day by reviewing more vocabulary words. Day 1: Take practice questions, not going through the full practice exam as you did in Week 1 but instead focusing on specific areas, particularly those in which you found you needed extra help. Spend almost two hours going over questions, testing your knowledge and studying more followed by some more vocabulary review. Day 2 and 3: These should pretty much be the same as Day 1, taking practice tests and studying different subjects as needed. However, it’s important not to focus all your energy on one area, even if you feel it’s the one subject you need the most help in. Practice and study your stronger subjects as well, especially since these are probably the areas you need to perform well at for your graduate program. Day 4: Just like Week 1-Day 4, sit down and take a full practice exam, all in one sitting, just as if you were taking the real thing. This will get you prepared for the upcoming exam only a few days away now. Day 5: Review your results from the full practice exam and do some last-minute studying on the topics you might still be having trouble with. At this point, you can skip the vocabulary review since it’s kind of late to try and add new words. Focus on the subject knowledge study and getting enough rest before test day. If you choose to study more than the recommended two hours and/or five days a week, remember to hone in on the areas where you feel you need help, whether they be subjects you’re struggling with or areas you know your ideal school will expect you to excel at. Whatever you do, whether you study five or seven days a week, two or several hours a day, make sure you stop the night before the test well enough in advance to clear your head, relax and get a good night’s sleep. Cramming the evening before your big test won’t help in your overall performance as much as a well-rested mind. When it comes to important tests, especially standardized tests that directly impact your future educational pursuits, preparation is not only key, but one of the most stressful things a student can experience. As you prepare for your upcoming exam, try these time-tested techniques to help ease the process and keep your mind clearer. Studying can’t be done overnight. One of the worst things you can do as you prepare for your exam is attempt to cram information in the night before the big test. Begin studying and getting ready as early as you can since this will allow you to better absorb the information and feel better prepared when the big day finally arrives. If you’ve given yourself plenty of time, you should be able to plan out study times, breaks and topics to help ease through the process. If you have clearly written goals and objectives for each study day or session, it’ll make it easier to chip away at the overall preparation process. Organizing your work space is just as important as organizing your calendar. A clean and clutter-free environment will help your brain function better so gather the essentials and clear away everything else when it comes time to hit the books. Although it should always be a priority, your physical well-being is especially important for a big exam as it directly impacts your mind. It’s easy to overdose on caffeine during late-night or early-morning study sessions so it’s extremely important to pace yourself and get plenty of sleep. Other healthy habits should be practiced including good nutrition, regular breaks to walk around and keep the blood flowing, and, of course, avoiding alcohol before the big day since a hangover will directly impact the result of your test performance. Final healthy tip would be to stay hydrated by drinking plenty of water. Studying doesn’t have be done alone but care should be taken when getting together with other people to study. Study sessions are an excellent option for fellow students and can benefit all parties. At the same time, you should be avoiding anyone else who is on edge or stressed out since stress is highly contagious. So if you feel your study partners are stressing you out more than the sessions are helping, it might be best to go it alone. Another method of getting outside help is actually to simply explain what you’re learning or studying to someone else. The best method of learning can sometimes be through instruction so as you find the words to describe things to someone else, friends or family who are not studying the same material, it’ll help your brain more fully maintain that information. You should be fully prepared for exam day way before you wake up and head out the door. Just like with your studying techniques, plan well in advance everything that you will need and do the morning of your exam. This planning should include gathering materials needed and fully reviewing the exam policies, time and location. You don’t want any surprises and you definitely don’t want to miss anything that you should’ve brought or done prior to the exam date. Your goal is to improve your score, but you first need to understand the basics behind the SAT questions. Doing SAT test questions are not enough, you should also work on the building blocks of mathematics that make up the questions. Thanks to understanding this, Ryan managed to score an 800 and now he wants to help you do the same. The SAT Math workbook has short explanations of each content area, and a total of 2,500 practice problems arranged in 100 drill sets of 25 problems each. This book is designed to help you practice the skills that need to be refreshed, honed, improved, or just need a little more practice on. By working through the book, and practicing your weak areas, you are guaranteed to improve your SAT result, and your understanding of math itself. You can work through the whole book front to back, or you can use it to practice areas where you’ve been making mistakes. You can also start with the drill sections (the worksheets) for a topic that you want to review, and then go back and read about the topic if you find you are having trouble. Who​ ​is​ ​this​ ​book​ ​for? – Individuals looking for problems they can do quickly on-the-go, so that they can study while traveling, between classes, or other short bursts of time. Ryan is a senior at de Toledo High School in Calabasas, California and a rising mathematics star. While studying for the SAT Math he discovered that there were no resources helping students with the fundamentals of maths, and since students didn’t revise the basics, they had trouble in the exam – no matter how hard they studied. If they didn’t understand the core topics in the test, or what it was asking for, then they couldn’t score high. Ryan spent months studying the SAT exam, the questions and the mathematics that was being tested, as well as looking at his peers and why they were having problems. Ryan went on to score 800 in Math (and 1560 overall). But what Ryan discovered while studying was ground breaking – most students were lacking the fundamental math skills needed to answer even the simplest of SAT questions. He spent his junior year and summer compiling an essential SAT math drills book that would ensure students knew the fundamentals of math inside out. 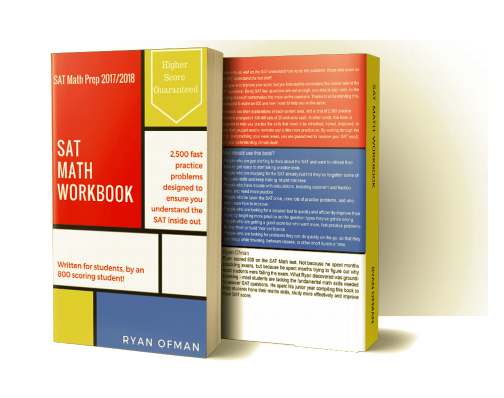 With a strong foundation of mathematics, Ryan helped his peers score higher, and in August 2017 he published his SAT Math Workbook. Within the first week the book became #1 New Release in the SAT Study Aids section of Amazon and is set to help thousands of students score higher in the 2017/ 2018 SAT’s. In his free time, Ryan can be found tinkering with some new piece of technology, reading sci fi novels, or programming. He is also a math tutor, a member of the speech and debate team, student council and part of the science academy at his High School. Every year there comes а time when parents are а little sad because their ‘babies’ are moving away for college, to study. As they walk away from their parents, there is a little grin; they are now independent! This time away from their hometown and parents is an excellent time for many individuals, but the issues arise for students when they come to living on their own in college. Many college students will look at living alone like on they have to do cooking and washing all along. Thus, they need to grasp the following tips for college life. It is pretty normal to have fears because you are a neophyte in this arena. However, you have to realize that if you keep feeding your fear, the more it will grow. And fear is an irrational feeling that we must face and conquer. The college will not give you time to adjust because the clock is ticking forward and it cannot pause. Thus, you have to maximize what little time you have to be able to adapt to your environment. If you are always healthily curious about whatever, you are a living example of someone who is keen to learn and grow. You are reading, asking questions, developing a concrete role to play in college, quietly observing on how things are done and going to take risks in trying new things. Don’t be afraid to ask for help. At the beginning it is always complicated, that is why you may need help from educational services or navigate to this smart assignment help. You should clear your thoughts of any negative ideas because once you have chosen a path, you need to go to that specific direction. You will need to have the firm attitude if you wish to be successful and popular in a particular field of investigation. Otherwise, your negative ideas will drag you deeper into the quicksand, and worst is you will have nowhere to go to. For every action you make, it should be from something you see fit and correct according to your devised plan. Some things are way beyond your control and you must create an action plan instead of waiting for incoming call from your mom. If you notice something not suitable for your plan, do not worry at all because it is bound to happen. Following your plan might sometimes prove to be the greatest challenge in your life, but that is it, a challenge you have to face. Feel certain to have all of your credit card information changed to the proper address. You don’t need any of those outlaw bills that just knock out your credit. Be sure you are on it as these are the years that start your credit rating days. And without decent credit, your life after college may not be as easy as it may seem NOW. This is also one of the most useful study tips for college freshmen students. Thieves will try to steal your identity or your credit card information, therefore you should keep valuable information in secret places and keep your door locked at all times. This may seem a little over the top, but an enormous amount of college students had lost items because they didn’t lock their door. When you are living at college, it means that you will be the sole controller of your expenses, work, study, essay submission deadlines as well as other not funny things. But, when you get used to all of these it will become easier. It could be a good idea to invest in a fridge and freezer (one of the compact ones), which will allow you to keep products fresh and frozen. And, for those critical snack times, you should buy a microwave when you need to have a hot meal. That is one of the first major things sophomores will advice. Staying healthy in college is quite difficult as there are college students in close vicinity. If you hear that another college student has come down with the flu and is bedridden, then there may be the possibility of you catching it and missing some important parts of your course. Therefore, if you feel unwell and ill, you should visit your college campus health center. Don’t attempt attending college until you have a clear concept of the type of profession you desire or perhaps possess a general idea. Speak with a career counselor to learn more regarding your choices and invest time to perform a little research concerning various educational institutions, technical programs and educational gadgets. Determine what you are enthusiastic about and locate a college that features an excellent program. In case you are the kind of person that may easily get lost in the competition, then find a small sized college where you should enjoy a more personalized experience. Do’s and Don’ts as a freshman in College. What is a freshman in college look like? Students should study where they can’t eat, like the library. Practicing good study routine not only converts to good grades but helps abstain from the freshman. Free food attracts people; party clubs often have a lot of free fatty food to be served. Substituting snacks into the day instead of a large meal can be a smart dieting technique, provided people choose low-calorie, protein rich high-nutrient snacks. But people will tend to do the opposite and munch on to the high-calorie snacks. Laziness is a main cause of obesity. College campuses offer various facilities to move one’s body and exercise, from the gymnasium to jogging trails sports club to just walking tracks. Take help of the break to burn those calories. Students who feel too drained to exercise should look at their life and figure out what’s out of balance. Dancing, swimming, aerobics or any sport that you play, any activity that you do will burn calories. A college education may cost a ton of money but could result up to a million additional dollars throughout your lifetime. Allow yourself the greatest possibility of accomplishing this by implementing every one of the terrific suggestions offered to you inside this article. All the best and may you succeed. Helen Birk is a scientific writer, freelancer, and musician. During her student years, Helen founded a research group at the university. After the graduation, she moved to Chicago. Now Helen works for https://customwriting.com/write-my-essay and performs articles for the magazine “Science and Life.” She adores reading and exploring new tendencies. Her colleagues say about her: “Helen is so smart and unpredictable that one day she’ll create a real masterpiece”. It seems that it becomes harder to study productively in the recent years, but why? Well, a lot of distractions around have emerged around us: hi-tech computers, smartphones, various interactive games and locations, soap operas, virtual reality and so on. However, all these things are only excuses. If you want to study, you’ll find time for that. The most difficult part is to put yourself together and just start. By making a study a habit, you will facilitate your academic life, and you will notice how you become more productive and happier. Thus, how to improve study habits? 1) Find a suitable place to study. It is one of the most important aspects because you need to concentrate only on studying. Such a place should not detract you from the workflow. A correctly set light will help you to stay focused. Pay special attention to working space and how to lay out the textbooks and notebooks. Also, ensure that your desk is clean and tidy. Try to work in other locations or library, for example. A quiet place with a huge stock of books will help you to focus on your studies. 2) Technologies. We live in the 21st century that’s we can’t do without your gadgets. If to use them accordingly, this will greatly simplify the learning process. Surround yourself with helpful and necessary gadgets. You can ask yourself, how it will help to improve study habits? In such way, you’ll get used to finding required information and using different resources, not only books. 3) Set your goals. Plans like “read more,” “get up early” or “learn something new” are too vague. Specify what you want to achieve. For example, “to learn 200 new words each week” or “to attend two pieces of training every week.” Consequently, you’ll be able to make a plan and follow it step by step, as well as know when you can rest and when you need to work. 4) Self-control. Improving study habits, it is necessary to control the process of development of these habits. For example, count how many seminars you have visited this month or how many books you have read. Thus, you’ll understand when you should work, and when to have a rest, also you’ll be able to evaluate the effectiveness of your plan. 5) Get used to studying when you feel active and peppy. You won’t achieve any results if you force yourself to work when your body and brain wish to sleep or relax. If you practice every day, you will develop a habit. Thanks to this, the learning process won’t be annoying, and you will be willing to carry out all the required tasks. And remember that improved study habits require constant reinforcement. It means that you can’t postpone a planned work even for a day. 6) Take breaks. It is important not only to work hard but also to rest. During the break, try to engage in physical activity. Take a ten-minute break every hour to have a snack and restore energy. Eat something that contributes to brain activity, for example, nuts, muesli, dark chocolate. 7) Spend your time with students with strong study habits. Scientists say that we tend to adopt habits from the people around us. Also, you can ask for a piece of advice how to improve study skills. Communication with such individuals will help you to retract and will facilitate the process of forming a new habit. 8) Find a company for study. Group lessons will help you to increase productivity because you will be in a circle of the same students. You will all study the same material, you will have one common goal. Group classes are also good because you can ask each other questions, conduct quizzes, at this time you will develop another useful habit – teamwork. Improving any good practice takes time and efforts, you should work hard to achieve this goal. Of course, at first it will not be easy, and there is a possibility that you will need help with your studies. For example, in writing an essay or doing a homework, such support won’t be superfluous. The most important thing is to understand the nature of habits. We must form them in such way as to be useful to ourselves: improve the character, broaden our horizons, develop professional skills. When we do something for our good, the chances of successfully forming habit are doubled. In a previous post, I highlighted some tips for getting the most out of learning by reflecting on its epistemological roots. The process of learning itself, though, is only part of the equation. Finding the motivation to get the ball rolling by applying oneself to learn is just as, if not more, important. There used to be a general acceptance that all intellectual pursuits were of equal value and if applied benevolently, advanced our civilization and the well-being of our fellow wo/man. We are, after all, all different…..each with our own set of gifts to share. But due to increasing societal financial pressures, valuation of learning has tilted heavily toward pragmatic subjects. This has in turn triggered the unfortunate “baby with the bathwater” human tendency to extrapolate such valuations toward an “all or nothing” pole (i.e. if you are learning about something that has no pragmatic value it must be worthless). If I were to define a novel, for example, I would say it contains a collection of scenes of different people reacting to different situations which, when combined, define a plot. If someone has read many novels (especially across a wide idealogical spectrum) wouldn’t this lead to an exponentially larger understanding of different people when compared with someone who views literature as a waste of time? Isn’t this a great way to build tolerance in our world? Learning foreign languages is something not always valuated positively, particularly in English-speaking countries, because “everybody speaks English anyway”. From personal experience, you never know when a language that you are learning will have pragmatic value. You could find a job with a foreign-based company that is looking for overseas employees with skills in its native language. Or you could even find a job overseas which would add to your own personal enrichment. I’ve had the great pleasure of being able to read the beautiful French of Rousseau writing in his native tongue allowing me to glean deeper truths from his philosophical works. Finding motivation in subjects deemed pragmatic is less problematic. The problem here is battling our own “demotivation”. Mathematics is a great example. In university mathematics it quickly becomes apparent that you do not have time to start from first principles and then proceed deductively to solve problems. What you do instead is to study the problems that have already been solved and memorize (yes, I said it, memorize) the solutions. Eventually, based on what you have learned from how the problem was solved, you can reuse it to solve other problems. The great mathematician Isaac Newton summed up this approach in saying “If I see further it is because I stand on the shoulders of giants”. A similar “classic problem” approach can be used to keep up in the fast-changing world of information technology. Resources such as www.stackexchange.com are abundant and provide a forum where magnanimous people help their fellow wo/man keep up and advance in the field. I’ve also tried to contribute with sites to explain Apple iOS programming , Android programming, and web services programming. A field of study that has been neglected in the past but should be a lifelong learning endeavor for all of us is physical fitness. Thankfully disciplines such as kinesiology, physiotherapy, and nutrition science have entered the mainstream university curricula as serious intellectual pursuits. Motivation to continue applying oneself to the upkeep of one’s physical fitness is 90% psychological. It is rare that one is too fatigued to make a trip to the gym but it is common that one rationalizes not going because of other “priorities”. For 2500 years learning was based on the model of Plato’s Academy. We would sit at the feet of a teacher who would share his/her learning with us. The Internet has changed everything. Now, knowledge is at our fingertips and it is up to us to find the motivation to chase this knowledge and to act upon learning it for our own and society’s well-being. This is not your average GRE vocabulary practice book. This book gives you a new perspective on learning GRE words – a perspective that’s fun, and easier than conventional methods. With the 2017 edition recently published (September 2016) of GRE Vocab Capacity, by authors Vince Kotchian and Brian McElroy, this book has already been noted as a must-have study resource for people who find it difficult, or merely simply too boring, to learn GRE vocabulary using the old methods. By contrast, this guide teaches you vocabulary through fun conceptual associations. What makes this book different then? To make something memorable it needs to create an intense, vivid image in your mind. Now, most GRE vocab books give you run-of-the-mill sentences that don’t really help you remember the actual definition of the word. That’s what this book does differently, and does well. Through mnemonic devices, or ways of connecting one concept to another so that you can recall the one you want easily and accurately, the book make GRE vocab learning fun again. Should you get the GRE Vocab Capacity book? Let me try answering this with an example. Another example is for the word ‘quash’ (which means to completely stop from happening). Fun, memorable examples such as these help you learn more difficult or seldom-used words, the ones whose definitions, no matter what you do and how many times you practice, you cannot seem able to recall correctly. With a high rating on Amazon by over 80 individuals, the book is a top choice if you want to make GRE study more fun and effective. So to answer the question, yes, you should get this! 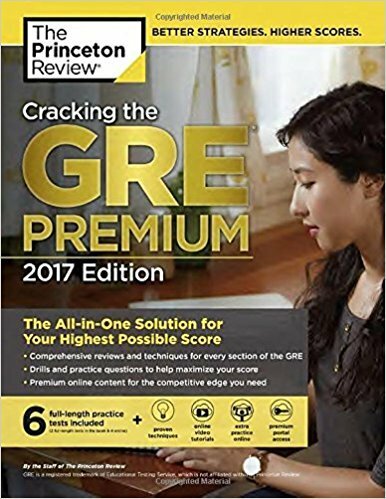 What’s all the hype with the Cracking the GRE Premium Edition? This prep guide is an all-in-one GRE resource that covers every aspect of the GRE test and equips you with fail-proof and foolproof tactics and strategies that ensure you make fewer errors, learn how to manage your test time better, and avoid common traps other test-takerss don’t even know they’re about to fall into. What’s in the prep guide then? – Every subject and topic in the GRE is thoroughly and expertly presented. – It comes with chapter summaries in bullet form to help you revise each chapter either all at once or chapter by chapter. – You get 9 different strategies on time management and error elimination. – There are easy to understand problem-solving guides to ‘crack’ each GRE section the smart way. – You’ll receive test scores for the online tests to diagnose your GRE score performance and progress as you study. Clear, simple video tutorials on how to use strategies when taking your GRE, real-life examples of admission officer interviews and b-school essays and the “GRE Insider”, a complete information package on grad school admissions, application requirements, test information and much more is all included in this premium access package. Princeton’s GRE guide is one of the most complete resources available. It will definitely prepare you for the test both in terms of building your confidence through proven GRE strategies as well in view of the range and quality of the practice tests and supplementary online material you have the opportunity to study with.